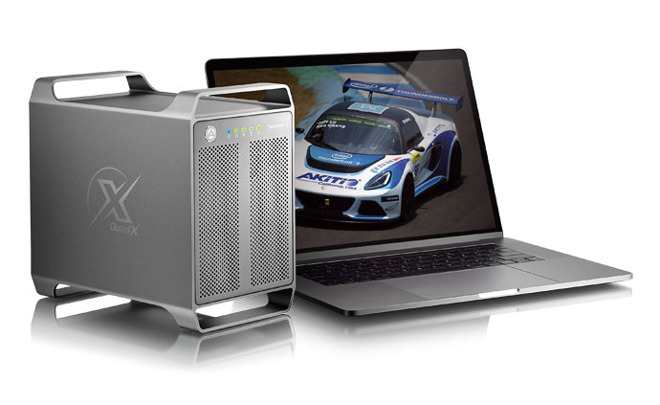 Enclosure producer Akitio has unveiled the Thunder3 Quad X, an external storage device that can also be used to connect a second display, as well as providing high transfer speeds to enclosed drives over a Thunderbolt 3 connection. The Thunder3 Quad X is capable of holding up to four 2.5-inch or 3.5-inch hard drives or solid state drives in removable trays. When using four SSDs in RAID 0, the unit offers data transfer speeds of up to 1480 megabytes per second, which Akitio claims makes it suitable for users dealing with large amounts of data, such as 4K or 8K-resolution uncompressed video files. Attaching to a MacBook Pro or a Thunderbolt 3-equipped PC, the device includes two Thunderbolt 3 ports and one DisplayPort 1.2 connection, which can be used to operate a 4K-resolution display at 60 hertz. While it does offer up to 27 Watts of power to each Thunderbolt 3 port using its built-in 200-Watt power supply, this does fall short of being able to charge a MacBook Pro, but could be used to provide power to less demanding devices. Aside from being used for the Thunderbolt 3 connections, which can be daisy chained to up to five devices, the Thunderbolt 3 ports can also be used to connect devices using USB 3.1 Type-C at speeds of up to 10 gigabits per second. Due to the 40 gigabit per second bandwidth of Thunderbolt 3, the connection is easily capable of providing enough bandwidth to drive two 4K video feeds to connected displays, while simultaneously transferring data to or from the drives at maximum speed. Equipped with an aluminum casing, two handles for transportation, and a fan for cooling the drives, Akitio expects to ship the Thunder3 Quad X in the third quarter of this year, priced at $379.